The one-of-a-kind glass sculptures of master glass artist Mark Einert evoke, not so much an image, as a motion through space, according to a time measure all their own. Einert attributes the fluid style of his glass and the elegance of the shapes to his work with Tai Chi and linking breath with bodily motion, explorations that he made at the same time he was training as a professional glassblower in Boulder, Colorado. He sought out the martial arts for a particular type of body and mind training, which the Chinese approach provided. The practice of moving his body according to choreographed patterns through space, in slow motion, and with high attention, influenced his outlook on life in general and left its mark on all of his handiwork in his chosen medium of glass. Einert is the son of a science professor. He learned very young the art of grinding scientific lenses to high accuracy and also worked with gems in lapidary cutting and polishing. 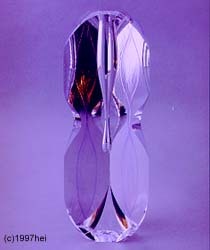 Einerts original designs in perfume bottles and paperweights show his extensive study and practice of faceting and facet-cutting. He was influenced by both hard science and science fiction ideas, and attributes some of his imaginative range and openness to altering techniques and materials to that beneficial influence. Einerts early ambition ran more along the lines of becoming a mad scientist than a professional artist, but he also did a great deal of drawing as a boy, and he returned to this medium in college. With his experience as an artisan and draftsman, he was ready for work in glass when he discovered the Bryan Maytum studio in Boulder. Something about the qualities of glass interested him from the outset. He had studied gems and crystals, and he had developed a fascination for certain glass paperweights, which appealed to him as frozen or preserved moments of time. 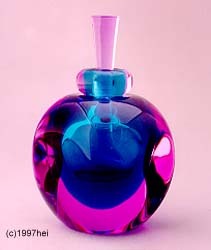 Einert apprenticed in the Maytum glass studio as a glass blower, learning the craft thoroughly, and then proceeding to do production runs of perfume bottles and glass lamps using the traditional furnace and glass-blowing pipe. Mark spent several years perfecting his technique and skills in the Maytum studio. He eventually became a supervisor and trained several apprentices himself. 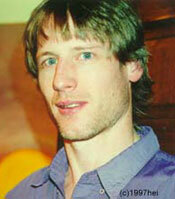 Later he helped set up another studio, for artistic glassblowing, with Susan DeMarke. 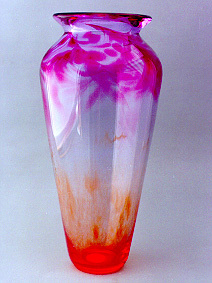 Several other distinguished glass artistsamong them Steve de Vries and James Clarkalso had their apprenticeships in the Maytum studio. 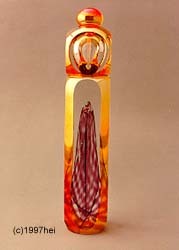 Even a glance at Einerts glass sculptures will lead you to marvel at the moments of time he has captured in his glass. He will tell you that to produce a glass piece that flows and twists in space smoothly without a glitch or a notch or a kink requires superb control and unremitting attentionjust as Tas Chi does. The creative process takes place while the glass is heated to approximately 1600 degrees Fahrenheit to make it viscous and flowing like honey. In this state, Einert says, the glass imprints with your motionyour gesture leaves its sign in the glass. Feedback is immediate on whether youve been smooth or jerky in your movementsany lapse in the artists attention shows in the hardened glass. 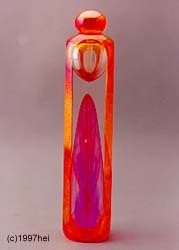 Einerts work shows his careful use not only of exquisite glass blowing technique, but also of the centrifugal and centripetal forces that come into play when the molten glass is spun or rolled on the rod. After meeting the artists of the Grass Valley Graphics Group and encountering the Reductionist art approach, Einert expanded his study of sculpture. The work of Brancusi, in particular, with his Bird in Space and other unique forms, showed him new directions in which to go. 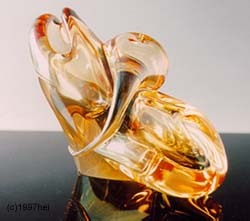 Einert feels that his work in glass, particularly the freeform glass sculptures, follows the lead of the materials and techniques themselves, and how the molten glass can flow in space. 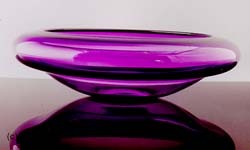 A glass artist must develop technical mastery and also an intuition for the work, a non-thinking expertise of motion. Einerts work has been characterized by archivist and author Linda Corriveau as moving meditations captured or energy forms in glass. Another area that Einert has studied and explored in his work is the bending of light through glass: refraction as in his lens-grinding and gem-cutting work. His faceted-glass bottles are first shaped from the molten glass then faceted on a grinder and polished to smoothness, yielding a combination of the blown-glass quality with geometrical exactitude of faceting. He has also been imaginative in his use of coloration in his work. He makes extensive use of the chemicals and materials that create iridescence (as in the traditional carnival glass) and colored glass within clear glass, in seemingly endless combinations. His flowers and abstract patterns captured within clear glass are also small marvelsand large conversation piecesto set on a shelf or a table.